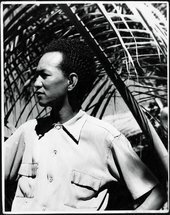 Wifredo Óscar de la Concepción Lam y Castilla (Chinese: 林飛龍; Jyutping: lam4 fei1lung4; December 8, 1902 – September 11, 1982), better known as Wifredo Lam, was a Cuban artist who sought to portray and revive the enduring Afro-Cuban spirit and culture. 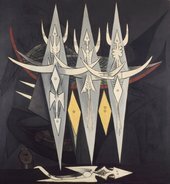 Inspired by and in contact with some of the most renowned artists of the 20th century, e.g, Pablo Picasso, Henri Matisse, Frida Kahlo and Diego Rivera. Lam melded his influences and created a unique style, which was ultimately characterized by the prominence of hybrid figures. This distinguished visual style of his also influences a lot of artists. Though he was predominantly a painter, he also worked with sculpture, ceramics and printmaking in his later life. This biography is from Wikipedia under an Attribution-ShareAlike Creative Commons License. Spotted a problem? Let us know.